With my geography background, I find books about other countries fascinating. Not having traveled to many of the places I read about, however, I sometimes have a hard time always knowing how accurate the portrayals of people and cultures are. So when I find a book by an author who has lived in and experienced the culture he or she is writing about especially refreshing. Naima loves to create the traditional alpana patterns Bangladeshi women and girls paint in their homes for special celebrations. Her designs are always the best in her village. But Naima wishes she could help earn money for her family. Her friend Saleem can drive his father's rickshaw. "If only I had been born a boy, she thinks." 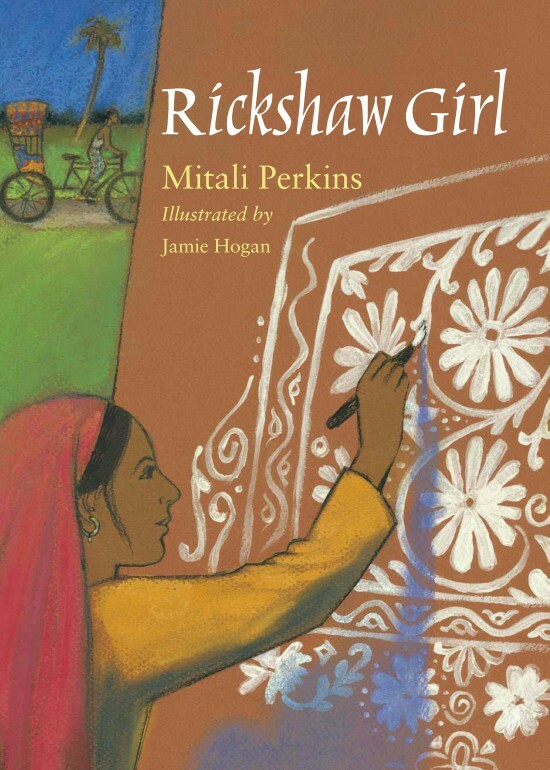 Mitali Perkins brings Naima quickly to life by showing us her love for alpana. But her impulsiveness leads to disaster, which causes her to abandon her passion, but her determination helps her find a way to help her family. Perkin's words flow freely and easily allowing the reader to focus on the story itself. The black and white illustrations add a delicate touch, giving the reader a feel for the art of alpana. 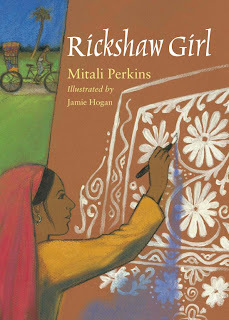 Match this book up with the following book for a quick look into the lives of girls in another culture. Cummings presents a brief overview of the life of a young Bangladeshi girl, Sabrina. Sabrina and her family live in a rural community in the northeast corner of the country. 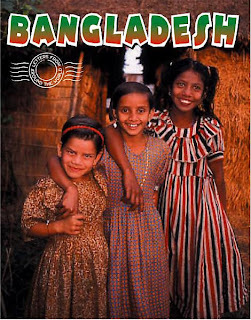 The book presents very general information about the climate, population, and living conditions of Bangladesh. The focus is on the girl and her family's lifestyle including food, shopping, school, and work and play. The book is not intended to give a complete historical or geographical background on the country, nor is it intended to be a guidebook. It is intended to give the young reader a brief glimpse into the lifestyle of a child in a different country and it does that quite satisfactorily. Being the last Monday of Women's History Month, I thought it would be appropriate to share a book about a women who made a difference in the world by speaking out for what she believed in. Such role models are especially important in a world that is growing increasingly conflicted. Effa always loved baseball. As a young woman, she would go to Yankee Stadium just to see Babe Ruth's mighty swing. 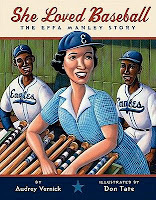 But she never dreamed she would someday own a baseball team. Or be the first--and only--woman inducted into the Baseball Hall of Fame. From her childhood in Philadelphia to her groundbreaking role as business manager and owner of the Newark Eagles, Effa Manley always fought for what was right. And she always swung for the fences. (Taken from the blurb on the cover of the book). Despite looking white at a time when it was difficult to be African American, Effa never denied her heritage. She both stood with and for her race. When protests were needed, Effa helped make them happen. When letters were needed, she wrote dozens over many years to get recognition for her players. While this picture book biography is hardly complete (picture book biographies are by nature incomplete) it does give the reader a glimpse of a woman passionate about a sport and its players. Tate's gorgeous illustrations provide a nice compliment to the crisp, narrative text, perfect for reading aloud. Recommended. For a teacher's guide you can visit the author's website. Other reviews of this book may be located at The Fourth Musketeer, The Page Turn, which includes an interview with the author,and School Library Journal. Grand Magazine includes an article about the book and the author. Good reads provides a book trailer. Nonfiction Monday is being hosted at Practically Paradise today. This week I attended a conference for the Utah Educational Library Media Association. I presented at the conference which was a new experience for me. I confess I was rather nervous, at least until I actually started talking about the books. Once I start talking about books I tend to forget almost everything else. Someone did ask me if I had my power point available on my blog and I told her that I would post it, so here it is. I will also include the three book lists I created. These lists include information on children's books of fiction and nonfiction that work great together for book talks or curriculum needs. I have them separated into primary, middle, and secondary grades. I hope these may prove useful. Here is the link for the UELMA website where other great resources can be found. 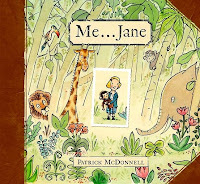 For Nonfiction Monday and Women's History Month, I have reviewed the picture book biography of Jane Goodall by Patrick McDonnell. Little, Brown and Company, 2011. Jane, along with her stuffed chimpanzee named Jubilee spent much of her childhood exploring the world around her. She not only noticed the plants and animals around her but she took the time to watch their behavior. Once when she wondered where eggs came from, she sneaked into her grandmother's chicken coop to find out. Jane also loved to read about other animals, especially African animals. She loved to pretend to be Jane from the Tarzan novels. Despite neighbors and friends telling her a life as a naturalist was not acceptable for a girl, Jane never stopped believing and with the encouragement of her mother, she became a naturalist. Today she still works to help both animals and people and encourages children everywhere to get involved because we can all make a difference. 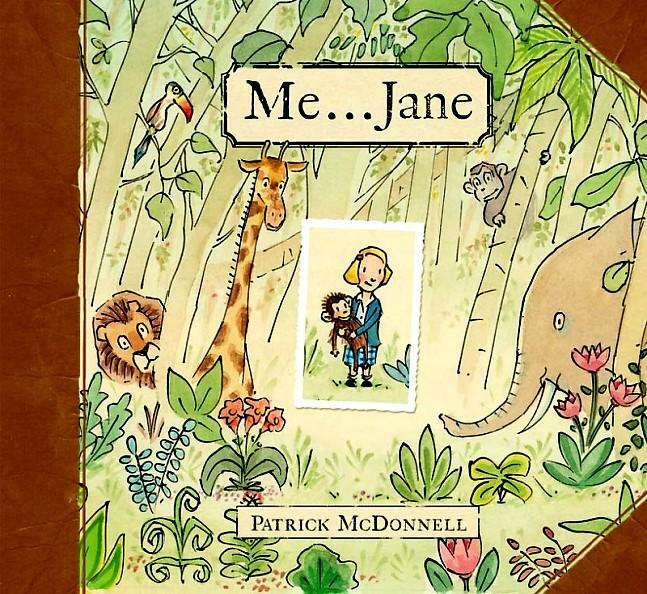 McDonnell's gentle touch matches up Jane's scientific curiosity and imagination through the engravings and illustrations he uses in this book. The engravings show the crisp science side of things, whereas the illustrations show the fascination with exploration that Jane still carries with her to this day. It would be hard to finish this book without a greater appreciation of world around us. Through the work of Jane and many other female explorers the world of possibilities has opened up for women everywhere. Other reviews for this book can be found at A Fuse #8 Production, 100 Scope Notes, and Kirkus Reviews. I admit I am rather fond of stories about mice, everything from The Tale of Despereaux to Brian Jacque's Redwall series. Unfortunately, I can't say that I am overly fond of the real thing. When I think of real mice, I always remember the time when I was a kid and we had a mouse die in the wall of my family's downstairs bathroom and the smell. It was a pain to get it out. This book kind of reminded me of that but not in a really bad way. Houghton Mifflin Books for Children, 2011. Reviewed from copy provided by publisher through netGalley. Hildegarde is in charge of a group of mice who live inside an actively used church. Her job is to make sure the mice are taken care of but especially to make sure that the mice are not discovered. If the mice are discovered there is sure to be a Great X. Unfortunately, Hildegarde cannot be everywhere at once and several mice sightings by members of the church congregation do indeed lead to a forced evacuation so the mice can avoid the Great X. And what will happen if the blessing on the animals, including a large number of cats must be moved inside the church? A nice book generally speaking, but I confess I did not find it particularly compelling. I appreciated the setting, Lowry does a splendid job creating the setting in the reader's mind. But I did not find Hildegarde a character that I could relate to very well. I didn't really start to like her until the last quarter of the book. She has good reason to be grumpy and resentful, but I didn't enjoy reading about it. I had no problem with the writing, and the illustrations by Rohmann were cute and appropriate. I have to admit though, the twist at the end surprised me, I was not expecting it and it made me laugh out loud. That was when I truly liked Hildegarde and her determination to take care of her 'flock' at all costs, even at great risk to herself. Overall, a nice book but not a great one. 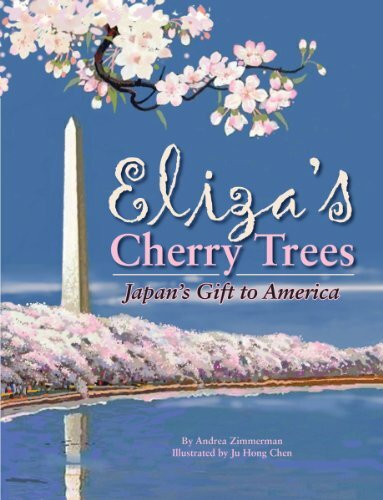 With everything that is going on over in Japan right now, I thought it would be appropriate to highlight a book that highlights a connection that we have with Japan, a peaceful connection. Eliza Scidmore loved to travel. From the time she was little and her mother took her to Europe, she dreamed of adventure and excitement in other lands. Woman had few options at this time (mid to late 1800s), but Eliza refused to let that stop her. She went to college and developed her writing skills. She wrote numerous newspaper articles and a couple of books. She traveled to Alaska, Japan, and Europe. She visited India, China, Russia, and Indonesia. But she especially fell in love with Japan, its people, its food, and its cherry trees. When she returned home after her first visit to Japan, she looked at the muddy riverbanks of Washington D.C. and got a wonderful idea. Wouldn't some of those Japanese cherry trees with their beautiful blossoms look great there. Eliza took her idea to the man in charge of the Washington parks, he declined. Over a span of twenty years, Eliza kept going back, every time someone new was placed in charge of the parks, but they all said no. Finally, she took her idea to Mrs. Taft, the wife of then President Howard Taft. Mrs. Taft loved the idea. The Japanese were more than happy to share their trees. Unfortunately, the first batch of trees were diseased and had to be destroyed. But the second batch was perfectly healthy and the beautiful cherry blossoms have been enjoyed by many since then. This is a great story of persistence in the face of many difficulties. Eliza had a good idea and she wasn't going to give it up. Zimmerman let's us see the difference that one person can make. The pictures of the blossoms are gorgeous and Chen does a fine job of showing Eliza through the years of changing fashions. He also offers us rather faded pictures of the places Eliza travels to, almost as if to say that those places couldn't be fully appreciated without being there, which is undoubtedly true. 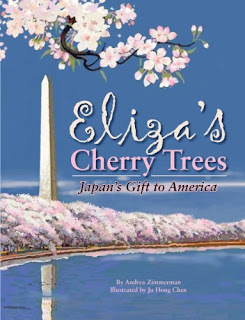 The pages showing the blooming cherry trees are definitely the highlight of the book with the bright colors and serene landscapes. The writing is clean and crisp and moves the story along at a brisk pace, which Eliza would surely appreciate. A nice book for reminding all of us just how connected we really are. Mix N'Match Monday: A Pet Skunk?! I missed blogging on Friday, I guess I was just too tired after running a book fair all week and two Praxis tests to take the next day (not one of my better decisions). But here are a couple of books to share with kids who are into atypical pets. 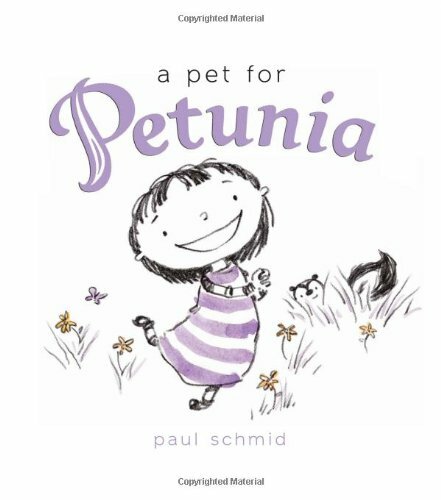 Petunia wants a pet, but not just any pet. She wants a skunk (a live one, not a stuffed one like the one she carries around for almost the whole book). Her parents are naturally horrified by this, but Petunia is persistent. She promises to feed it and brush it and be responsible for it. Her parents tell her that skunks stink, but this does not seem to phase her. Will her opinion change once she runs into a skunk for real? I'll let you read and find out. I must admit the twist at the end surprised me. In a fun way of course, I laughed out loud catching the attention of a teacher walking by. This is a delightful book, perfect for sharing with young readers who desperately want pets of their own. The pictures provide a nice complement to the humorous text. There are few children who won't be able to relate to Petunia. However, you may wish to combine this book with this next one, in order to discourage students from wanting skunks of their own. Sandra Markle has a gift for writing nonfiction like a storybook. I especially appreciate the fact that her writing matches the illustrations to perfection. I find it very irksome to be reading a nonfiction book in which the illustrations don't match what the author is describing. That is not a problem in Markle's books. This particular book is part of a series called Animal Prey. Each book focuses on a different animal prey. Markle introduces us to the life of a skunk, what it eats, where it sleeps, and how it deals with predators. All the information needed to get a good overall picture of the life of a skunk is presented, but it is presented in a narrative which is great for reading silently or out loud. I have several of Markle's books in my library and my students love them. Highly recommended. One thing to keep in mind, however, is that Markle does not ignore the more gruesome aspects of life in the wild. There is nothing overly graphic in this book but the books on predators generally depict these awesome hunters doing what they do best. I am in the middle of a very busy week, with a book fair and a test to study for, so this will be a short post. I was thinking today though about some of the places we can travel in this world we call earth. There is one place though that we can travel to without ever leaving home and that is the world of our imagination. This place is a lot cheaper than any other place on the planet or off. I confess to spending many happy hours visiting different places in my daydreams, mostly real kinds of places, but when I open a great fantasy or fiction novel I can end up almost anywhere. Nonfiction can also transport me to different places and times, places I can not go in the real world. So today I have a couple of picture books to share that demonstrate the joys of using our imagination to go places. Reviewed from copy received from publisher through NetGalley. 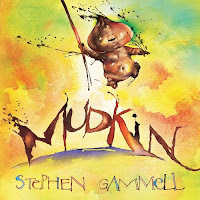 The first book is called Mudkin by Stephen Gammall. 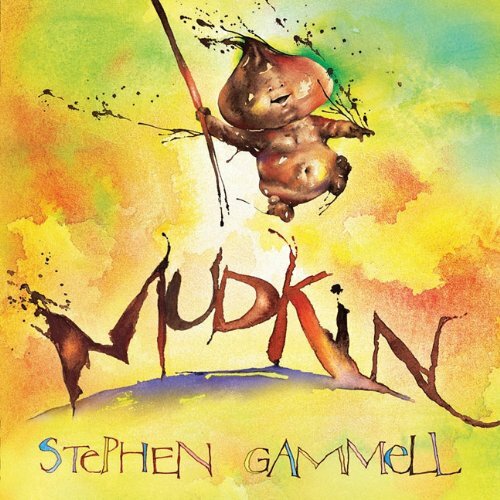 In this book a young girl goes outside after a rainstorm and has a delightful time playing in the mud. She imagines a creature formed from the mud called Mudkin. He asks her, in his own mud language which consists of brown smudges, to be the queen of his mud kingdom. She imagines receiving a mud robe and crown and riding to see her subjects in a mud carriage. It all washes away when it begins to rain again. 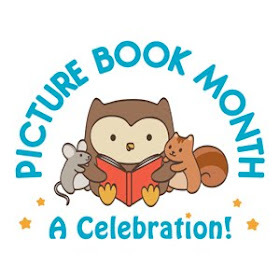 I love the idea behind the book, the idea that our imaginations can take us anywhere and the illustrations are certainly bright and colorful, which I like in a picture book. But I guess my adult instincts are to strong, all the mud kind of makes me wince. Although I do have to laugh when I remember playing in mud with my siblings. Also, the pictures are too messy for my taste and the few words there are in the book could be confusing for children without explanation. All in all though, Gammall gives the reader an ode to the power of imagination to make even the simplest thing into something grand. Albert Whitman & Company, 2011. I found this book to be delightful tribute to the world of imagining. 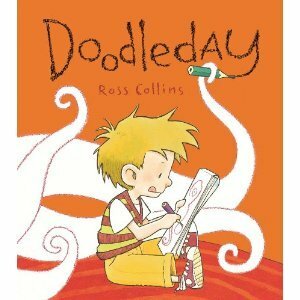 Harvey's mother warns him before she leaves for the store that he mustn't do any doodling while she is gone, because it is Doodleday. Harvey does not understand why this is the case so he picks up his colored pencils and starts doodling, first a fly that to his shock raids the refrigerator. Harvey quickly draws a spider to get rid of the fly, unfortunately the spider is more interested in his father. To get rid of the spider, he draws a bird, which proceeds to rip out their fence. I'll let you discover the last creature he draws in his desperate bid to fix the devastation being wrought. Hint: look closer at the cover. Finally, he gets help from the only creature tougher than any drawing: MOTHER. I love the humor of this book, any child can relate to getting themselves into situations that require help to get out of. The book is a fun reminder that while visiting other places is great and fun and intriguing, sometimes there is not better place to be than home. The use of what I assume is crayon to contrast the drawings with the rest of the illustration is inspired fun, perfect for reading curled up in bed or as a read aloud with a class full of children. Sure to be a hit. Now it's time to be off to the place where I do a lot of my imaging, the world of sleep. Enjoy! Native Americans have long been under appreciated, along with African Americans and other minority groups, for the contributions they have made to the development and survival of the United States. During World War II as the war in the Pacific was heating up, the Americans desperately needed a way to send and receive messages that the Japanese couldn't intercept and interpret. The Navajo language offered the best solution. This historical fiction novel follows the experiences of Ned Begay as told to his grandchildren many years after the fact. He starts by explaining his experiences at a boarding school where the teachers did everything they could to strip the students of their Navajo identity. Ned survives by becoming the model student, on the outside, but sneaking around with some of the other students, he manages to keep his language skills. Later, as he works his way through high school dealing with racist treatment all the way. But he decides he wants to serve his country. He convinces his parents to let him join the Marines at the age of sixteen. 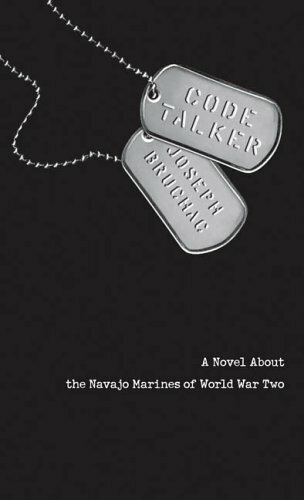 He becomes a code talker and used his language skills to communicate through some of the worst fighting of World War II. A fascinating look at a part of history that is often overlooked, directing well-deserved attention to those who provided a vital service at an important time in our history. Bruchac does a fine job of honoring those who have so long deserved the recognition. The detail he provides gives the reader an idea of the horrific loss of life that occurred during World War II. The writing is solid, just like Ned Begay. This book combines well with a nonfiction book about the history of codes and the sending of coded messages. 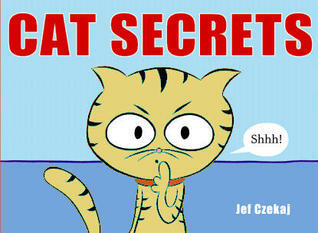 Sending secret messages is a interesting topic for most kids. This book provides a great introduction to the topic and provides plenty of opportunities to practice one's deciphering skills. 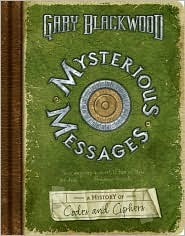 Blackwood starts with Ancient Greece and the first hidden messages. He then goes through a variety of strategies used over the last several thousand years, including the Navajo code talkers. A well written, fascinating study of an always popular topic. For those who have the time, I recommend deciphering the codes from each chapter. These two books provide an interesting way for teachers to show students that history is anything but boring. It would be fun to see how fast the students could decode some of the messages. Bad Kitty wasn't always a bad kitty, in fact she used to be a good kitty, until the day there was no kitty food in the house, only 'healthy' food. Bad Kitty then proceeds to destroy the house to show her displeasure. Once appropriate food is provided, Bad Kitty becomes good once more, although the reward she receives for her good behavior implies that her good behavior is not going to last. The following books contain the same sort of humor. Interestingly several of the follow-up titles are chapter book length. The author manages to insert ABC lists four times into Bad Kitty, which is quite an accomplishment in and of itself, but he also keeps the story moving forward to hold childrens' interest. I have shared this book with my kindergartners and they enjoyed it greatly. The colorful illustrations and design provide a nice complement to the wacky parts of the book. Recommended. I also used the following two stories to complete a fun cat story time. Three cats prepare to read their book of cat secrets. When they discover that the 'reader' may not be a cat they devise a series of tests to determine whether the reader really is a cat or not. While focused on the reader, the cats do not notice a mouse doing its utmost to get its hands on the book. The straightforward illustrations are perfect for sharing with younger children, reminiscent of Mo Willem's work, they allow the reader to focus on what is happening without being distracting. The 'tests' that the cats come up with provide a perfect opportunity for children to participate in the story. The ending is a bit abrupt, and it would have been nice to find out some of the 'cat secrets' but the story still provides plenty of fun. Willy wakes up horrified to discover that his stuffed monkey, Bobo, is missing. 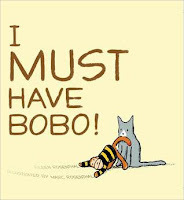 He explains to the reader why he 'must have Bobo'. 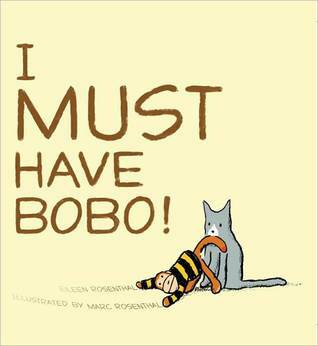 When he goes searching for his stuffed friend, he discovers that Earl, the cat, is also determined to have Bobo. This is another fun book that showcases the independence of spirit that cats are known for. While Willy is willing to compromise with Earl, Earl is most definitely not willing to compromise with him. Anyone who has spent time around cats is likely to laugh or roll their eyes at Earl's persistence. A good read aloud that begs for the reader to 'become' Willy and share in Willy's attachment to his toy. Pets are a sure fire winner when it comes to story times and these three books are good choices. I chose to review this book on my Wild & Wonderful Wednesday feature, despite the fact that this book takes place in the United States. I chose this book for a couple of reasons. First, many of the characters in this book are immigrants who have come to Manifest to work in a mine. Second, the location of this story (the town of Manifest) plays such a key role in the story, and that is what geography is all about, the interactions of human beings and their environment. Would this story have been the same if located somewhere else? No, without the town of Manifest, the story would have been very different indeed. While the town is fictional, Vanderpool explains in the end notes that it is very much based on real people and real places. This book integrates present and past as smoothly as any I've ever read. In fact, the characters from the past almost overshadow the characters in the present. Almost, but not quite. This is very much Abilene's story about family and hope and community. The main theme, I felt, was about how human beings often make assumptions that prove to be incorrect and only by taking the time to look deeper can we truly get to know each other. The writing becomes secondary to the journey the reader makes, hoping, like Abilene, to find a place called home. I find this book very much worthy of the Newbery Medal that it received. This book would make a very thought-provoking read aloud for any American History class.